Last year I jumped on the Alex and Ani bandwagon and became obsessed with collecting pieces for my wrist. However, I was not happy with their options for a Marathon bracelet - I desperately wanted a bracelet that showed 26.2 but do not like their "it's not a sprint it's a marathon". Then Milestones Sports Jewelry came in and saved the day with their adjustable bangle bracelets and I am giving one away today! 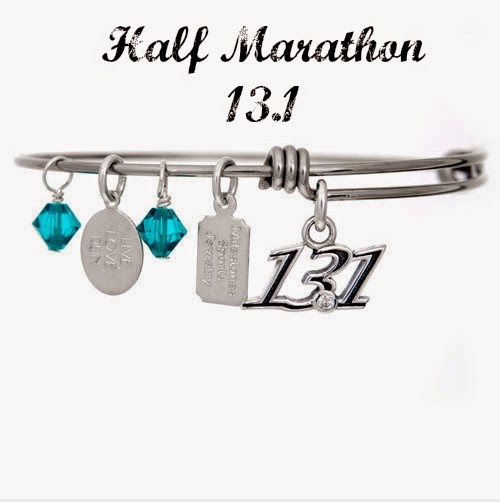 I was so happy to hear Milestones Sports Jewelry added adjustable bangle bracelets to their lineup of sports jewelry and they have options for all runners. Plus you have the option to personalize your bracelet with additional mini charms and swarvorski crystals! As I mentioned above, they offer many options for distances and events - including the Dopey Challenge, Glass Slipper Challenge, Space Coast and more! 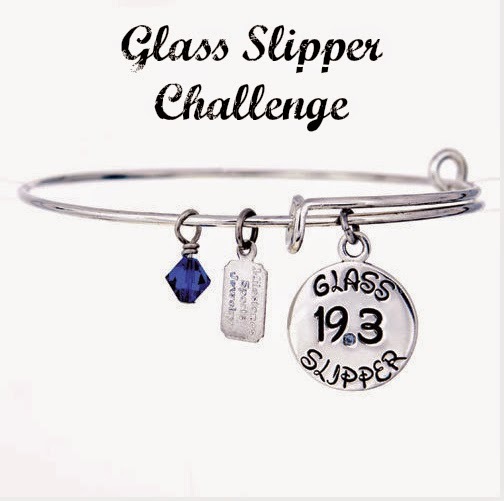 I had a very hard time choosing one - so I went with the 26.2 bangle charm bracelet, which features a crystal for the dot in the 26.2. I also added on a 13.1 miniature charm and a clear swarvorski crystal. 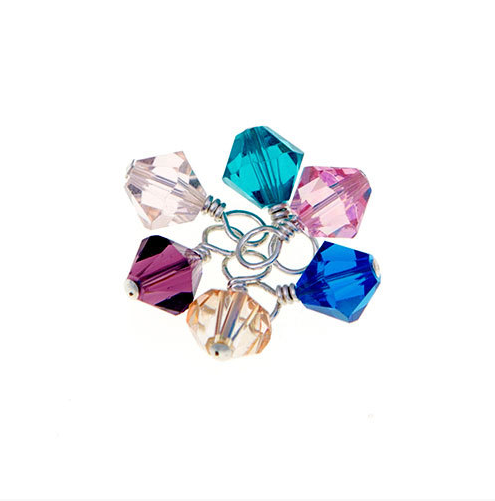 This will be an amazing addition to my current lineup of adjustable charm bracelets. I ran the inaugural 2014 Dopey Challenge and would absolutely love to add this to my collection to showcase those 4 days of testing my limits. I am running "only the marathon" this year and it shocks me that I pulled this fete off 11 months ago. 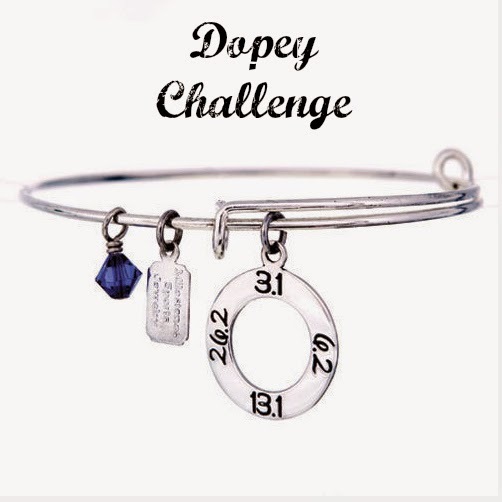 A month after I ran the Dopey Challenge, I participated in the Glass slipper challenge. I would also love to add this one to my collection! After I completed this challenge, I vowed I was done with anything over a 10K. The following day, I signed up for another half....a few months later two more fulls. #runnersproblems. After I ran my first 13.1, I wanted something so bad to celebrate my achievement. There wasn't much on the market at the time, so I settled for a car magnet. I would have bought this bracelet in a heart beat if it was available then. I have many friends who ran Spacecoast over the past few years. I have yet to conquer this event but it is on my bucket list. 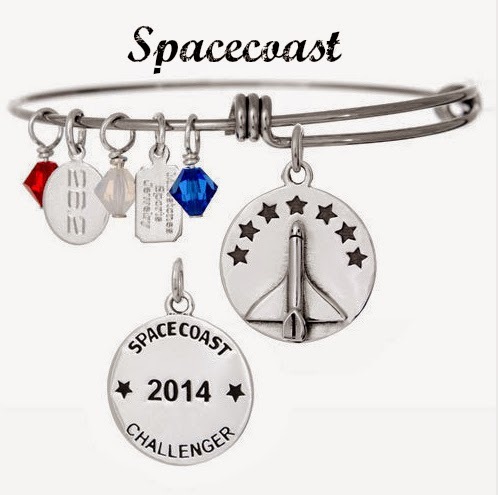 I adore the Spacecoast themed bracelet! My first 26.2 was the 2013 NYC Marathon and this was the first time I ever bought myself something to commemorate my achievement. Tiffany Co is one of their sponsors and I got myself the NYC Marathon charm and added it to my charm bracelet. I also got one at the 2014 race. However, I also own the above expandable bracelet because I do not like wearing my Tiffany Charm bracelet - especially while working. I will never forget my first 5K. Gabe and I went all over trying to find something to commemorate my very first race. I was SO proud and told anyone who made eye contact with me that I finished a 5K. There is hardly anything on the market for 5K achievements, so it made me happy that Milestones celebrates all the races. 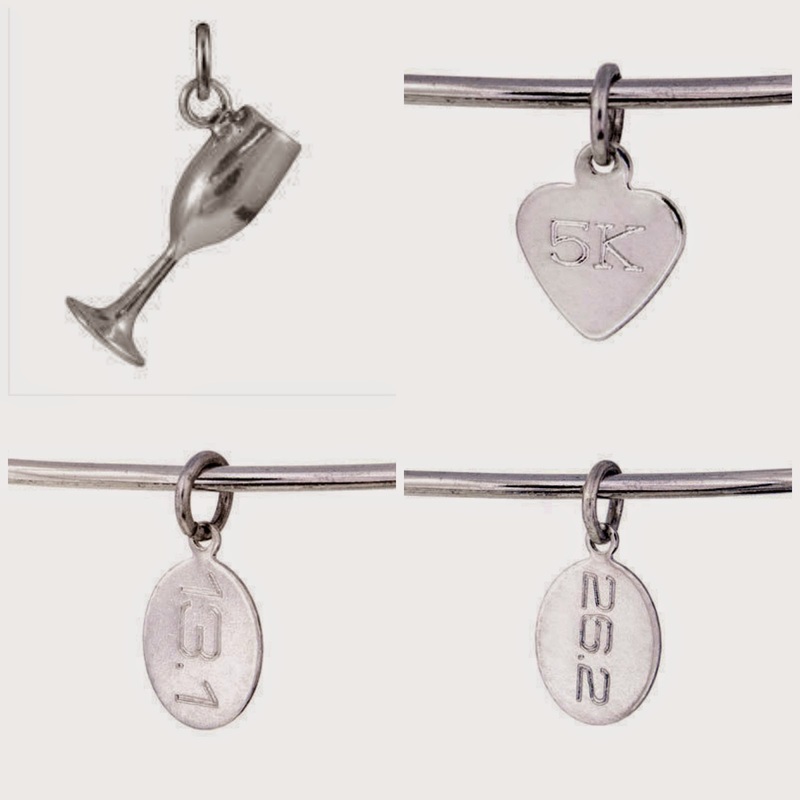 Above are the small charms you can add to your expandable bracelet - including a wine glass!! There are also multiple options for swarvorski charms! 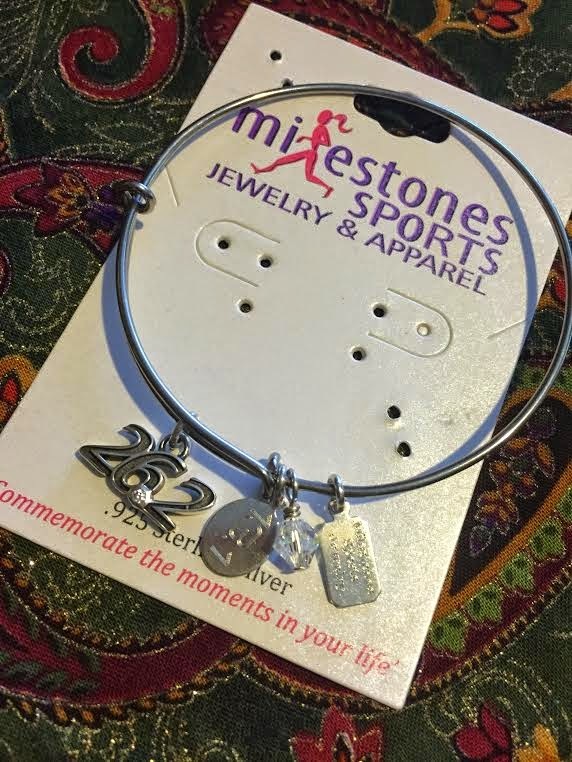 Click here to check out all of the Milestones Sports Jewelry Adjustable bracelets that are available and let me know in a comment below which one you would choose and what it commemorates! You should see a Rafflecopter Widget below this - after you comment, go through the widget to gain your first entry and unlock more chances to win. If it doesn't appear right away, please give it a few minutes and refresh. I would give this to my mother inlaw as a gift. She just completed her first marathon. She has been training everyday for the sparkly princess run 13.1 coming in Feb. I know she would love this just as much as she loves to run. I would choose the 26.2 bangle bracelet. But would serve as a reminder of a goal to one day run the Marine Corps Marathon. 13.1 ! going to run that for the first time !! I absolutely love Milestones! I have tons of their Pandora style beads and Christmas ornaments. But I did not know they made bangle bracelets. I think I'd get something NYCM related. I'd like to get 13.1 since I have completed 6 half marathons in the past 2 years. I would get this for my mom, who just completed another marathon last week! I go with 26.2 to motivate me for my 1st marathon that is coming up in 2015.